This week, we conclude our series on assessments. In keeping pace with this theme, I wanted to tell you about the Coaching Report for Leaders. 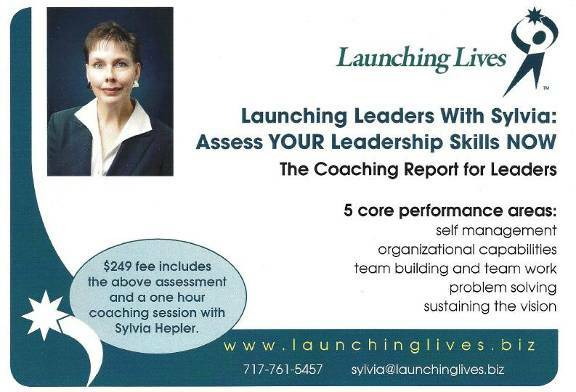 Take advantage of this opportunity to do the assessment, get the results within 24 hours, and experience one hour of coaching with Sylvia. This entry was posted in Assessments and tagged 360 degree assessments, assessments, Business, career tips, CEO, coaching executives, coaching report for leaders, criticizing, employee behavior, Executive Coach, for the employee, for the employer, human resources, judging, launching lives, manager's coach, Sylvia Hepler, work tips. Bookmark the permalink.